When plugging a USB stick into a Mac, OS X creates a number of hidden files on the stick, including a Spotlight index and Trash folder. It even does this on the xD memory card for my camera, so after having copied my pictures and deleted them from the card, the card is still full. Is it possible to turn this off for USB and memory cards, so OS X either writes these files to the primary disk or doesn't write them at all? UPDATED March 2018 It seems my solution is not valid anymore, the solution that works right now is proposed by @ElmerCat in one of the answers below. For just a particular mounted volume - like a flash drive called yourUSBstick in this example - these commands will remove existing cruft, stop Spotlight indexing now and in the future, stop the related fsevents logging, and disable the Trash feature. Other unfamiliar stuff you may still see you probably want to keep, like Apple double "._*" files and other Apple DS cruft relating to icons and window placement. 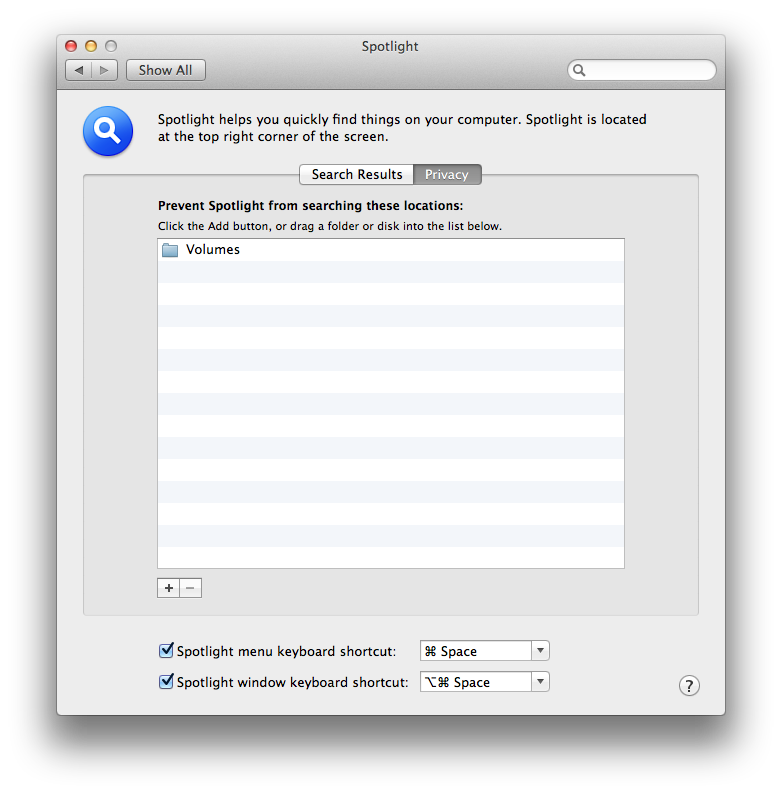 To keep Spotlight from indexing non system volumes, add /Volumes to the Privacy list in System Preferences > Spotlight. /Volumes is the point in the file system where all non-system disks are mounted by default. Navigate to Macintosh HD > Applications > Utilities and open Terminal. /path_to_volume: Indexing disabled. under Mac OS X 10.5 or later. Spotlight will immediately cease to index the specified volume. If you are using Mac OS X 10.5 or later, skip to step 9. At the Terminal prompt, type exit then press return. Thanks to thexlab.com, their troubleshooting Mac OS X e-books, and their website for the detailed explanation of why other methods sort of work. Another way to deal with (just the) spotlight files, is to add that volume to your Spotlight exclude list. Plug the device in, and go to the Spotlight prefpane in System Preferences. Select the Privacy tab. Now drag that volume from your desktop up into the privacy list.. or use the + button at the bottom to add it. No more spotlight indexing will happen on that volume. You'd think after all these years, Apple would build something into the Finder to deal with this. It's still a very common problem for people using USB disks or SD cards to play media in their cars or other devices. Nonetheless, developers have filled the void with numerous Apple-approved apps. The apps listed in previous answers might have been good at the time, but they haven't been maintained to work with modern versions of macOS. I'd also be a bit wary of installing something that will wield total control of the filesystem, written by unidentified developers. Not wanting to deal with the App Store is one thing, but not wanting to register with Apple as a developer is another. Moreover, something from the AppStore has undergone at least minimal auditing by Apple and can be removed from your computer as easily as it is installed. So, whenever you happen to read this "answer", its advice to you is to search the App Store for something up-to-date, well reviewed, and free. Tomorrow, something better may come along, but the bottom line is: the App Store has free, easy solutions to j-g-faustus' original but enduring question, posed here so many years ago — a question I had myself today. So I apologize if this seems more like a rant than an answer, but indeed, all of the previous answers were out-of-date and didn't lead to a useful solution. Not saying something would lead more people to waste time fiddling with the Terminal or installing questionable apps. Just go to the App Store — you won't need to pay. I use the MacOS Terminal command line to list and delete all these files and folders before ejecting the device from the desktop. For some files, you may have to sudo the /bin/rm command. I use Clean Eject (free) and a custom Automator Service (still private) so I can assign a hotkey to clean & eject a volume using the app. 2) Type /Volumes and click Go. 3) A Finder window will open, and it should say Volumes at the top. 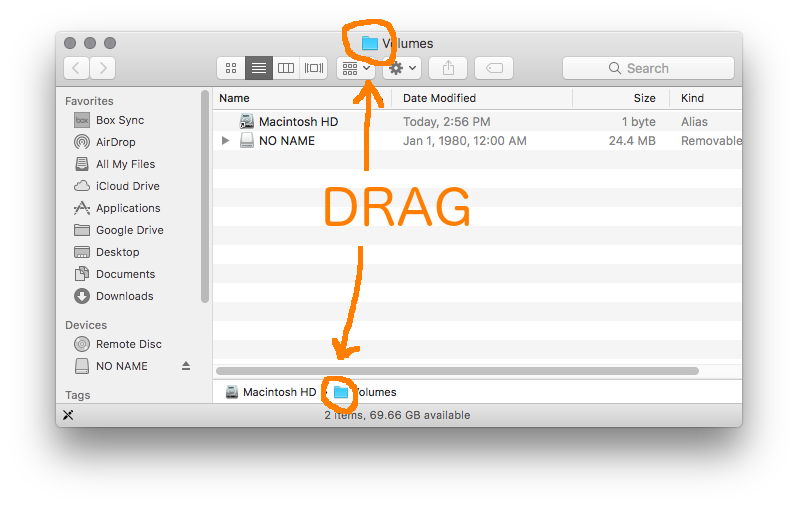 4) Next to where it says Volumes at the top of the Finder window, there is a tiny blue folder icon. Click and drag this icon left into your Favorites panel. Actually touching the .Trashes file will be the best way to solve your main problem since .Trashes is now a file instead of a folder. This means that Apple can't relocate the files to the .Trashes folder when you delete them and your drive is no longer full. Another option is to hit Cmd-Opt-Shift-Backspace to force Finder to empty the .Trashes content on the card before you eject it. The first method is really the best as the second affects all Trash contents on all drives. However, it seems from your post that you are more worried about the pollution of the drive by the various dot files. If you follow the steps mentioned above, you'll save your disk space, but there will be a minimum of dot files created. An easy way to stop my car audio trying to read hidden Mac OS files is to remove them in Windows OS. Simply copy your MP3 music to the USB stick from iTunes. Swap the stick into Windows OS and select view hidden files from folder options. This will then allow you to delete every single hidden file that your trusty Mac placed on your USB stick including those pesky .trashes files. Finally a use for Windows OS! I ended up using a free app "Hidden Cleaner". My car's MP3 player was trying to read . (MP3filename).mp3 (hollow, empty mp3 files) as well. 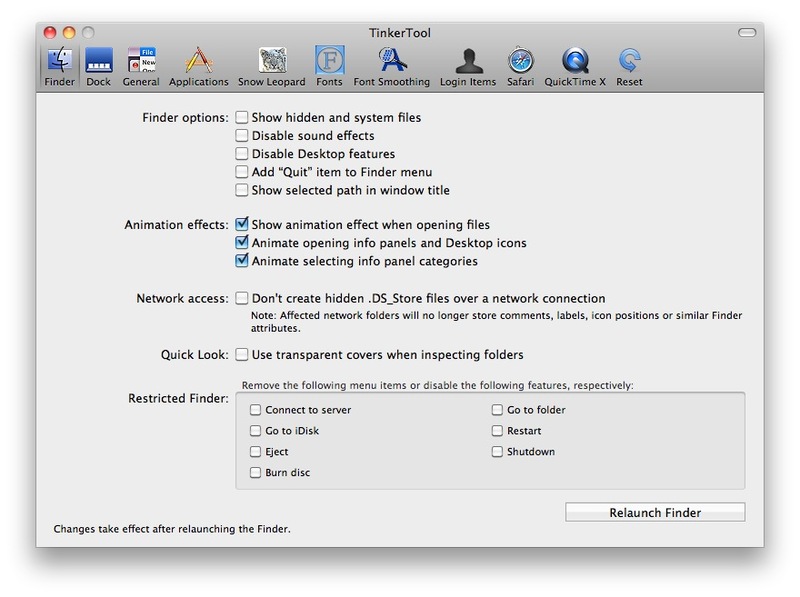 Go to Macintosh HD in Devices section on the Finder left hand menu and drag your USB drive and drop onto the Hidden Cleaner app. It will cleanup the hollow files and leave the real MP3s and will eject your USB. Note: That is not a permanent solution. You need to do above everytime you copy files. I don't mind though. After installation, and a reboot, no more .DS_STORE on USB drives, with the advantage (for some of us) of not having to disable indexing on external drives. Since version 1.4 it also supports OS X Mavericks. Update from Aepsis website: "Warning: Asepsis is no longer under active development and supported under OS X 10.11 (El Capitan) and later. Most of the solutions here are 'clean up dotfiles before eject', rather than 'prevent dotfile creation'. In my search for a free solution for the former, I've tried a few options, and settled on the applescript here: SuperUser: Does anyone have a Mac Terminal script to remove hidden files? because it allows me to see exactly what's happening along the way. Note in my comment on that answer that I made a small edit to get it working on OSX 10.12.1. (I'm not reposting the source in this case, as this seems a pretty 'link friendly' question). Dumbest thing ever that I can't simply contribute this to Metaxis' answer. But it's easy to create a bash script that automatically handles this for all folders in /Volumes (or a specific one if you specify). Should be able to invoke it with Automator or Applescript when a folder appears under /Volumes, then you have automatic disabling of indexing. echo "mdutil -i off $1"
find /Volumes -type d -maxdepth 1 -mindepth 1 -print0 | xargs -0 -n 1 "$0"
I found this App in the Apple App Store for free and use it, and it has worked great for me. You have to search "cleanusbdrive" all one word without the quotes in the App Store. It's by José A. Jiménez Campos. 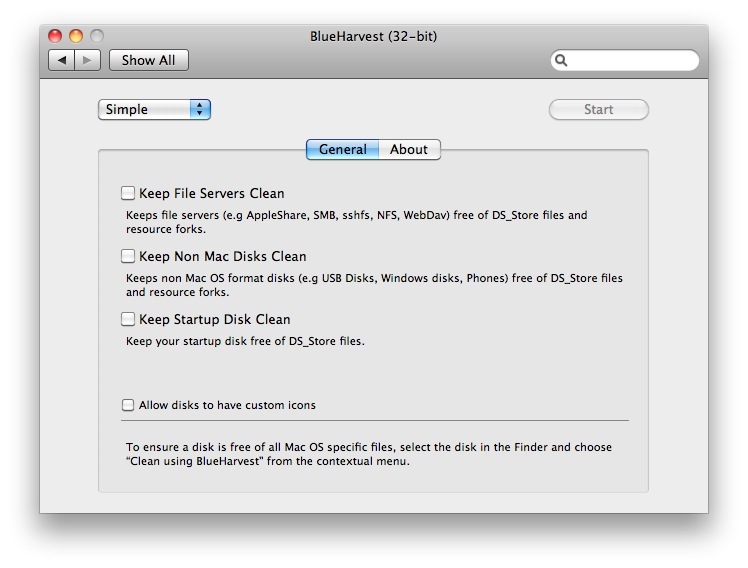 Another OSX utility for removing these extra files is DOTCLEANER which can be found on the OSX App Store. Currently, Cleanmydrive2 is available on the app store for free and handles this problem for user up to high sierra. I got this to work on Sierra 10.12.3 in Automator. First, I made this version of the script: It functions the same way as freefly42's, just a different way of writing the same thing. If run with a commandline argument, it tries to see if the argument is a directory, and if that directory contains a file named ".disable_osx_metadata". If the special file is not there, then nothing happens. That drive is ignored. If the special file is there, the script deletes all the osx metadata and creates a few small new items which prevents anything else. For instance, creating a file named .Trashes prevents the OS from creating a directory named .Trashes and then writing files in there. If run with no arguments, it runs itself once for each directory in /Volumes. So, if you run it manually or click on it, it checks all attached drives. If you create a workflow in Automator, then Automator runs it whenever a drive is attached, just for that drive. Save as "disable_osx_metadata", chmod 755, copy to /usr/local/bin . Then I found that even in Sierra 10.12.3 you CAN still add the /Volumes directory in Automator, by a non-obvious way. Go to Finder, File, "Go To Folder...", manually write in "/Volumes" and hit Enter. Now this shows you a window with your HD and usb drives, but no obvious "/Volumes" folder to click on. But the title bar says "/Volumes", and it appears at the bottom too. 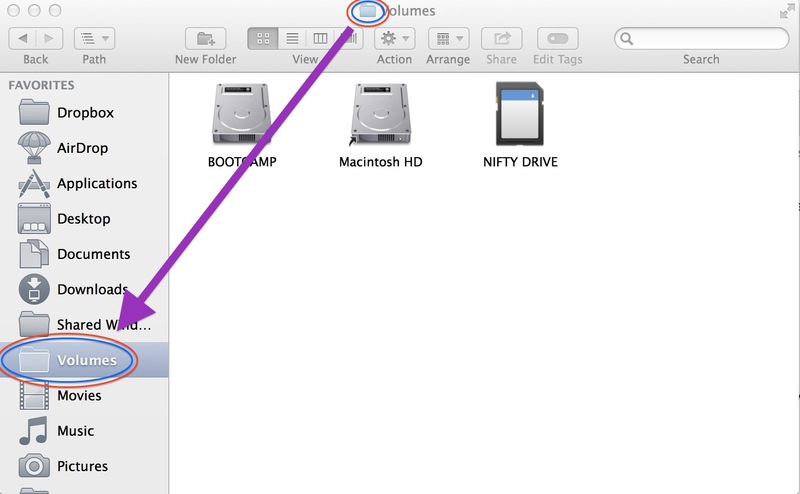 You can drag the folder icon next to "/Volumes", either from the title bar or from the bottom, over to the Automator, and drop it on "Folder action receives files and folders added to:[______]"
Back in Automator: on the left, scroll down and drag "Get Folder Contents" to the right and drop it. Then on the left again, scroll down and drag "Run Shell Script" to the right and drop it below "Get Folder Contents". Then drag the script from /usr/local/bin onto the box under "Run Shell Script" so it says "/usr/local/bin/disable_osx_metadata"
For reference, this gets saved in: /Users/YOUR_NAME/Library/Workflows/Applications/Folder Actions If you save something wrong, I think you have to manually navigate there in Finder to delete it. Finally, for each new usb drive you want to protect, you have to create a file named ".disable_osx_metadata" in the root folder. Or just keep a small text file around with a visible name (no leading dot) and copy it to the root of any new usb drive and rename it .disable_osx_metadata after copying. That drive now gets cleaned each time you attach it from now on. Not as clean as I'd like. You have to pollute the drive a little, in order to tell the OS not to pollute it more. There seems to be no way make the OS simply leave it alone and not add any files that you didn't ask for. TODO: Add enable/disable functions to create/remove the dot-file. TODO: This does not prevent the .DS_Store files in every directory. TODO: Is it possible to package up the script and the foo.workflow file so a user can skip most of these manual directions? 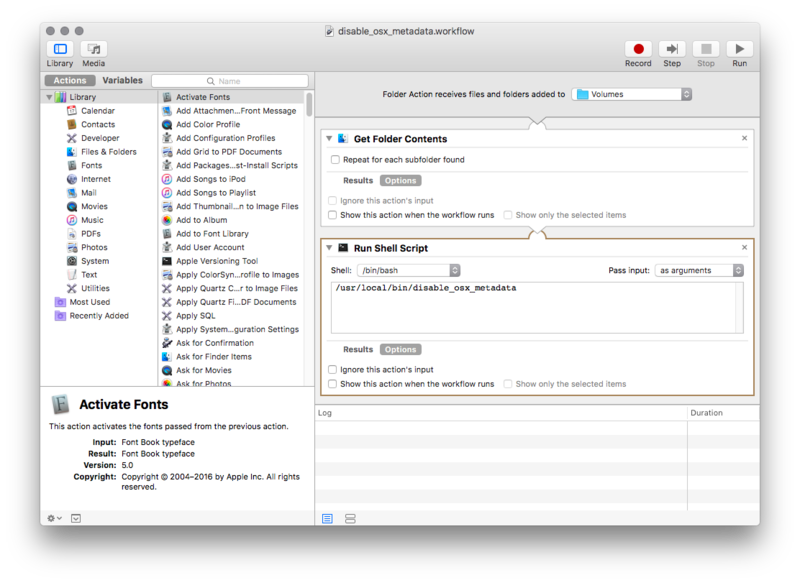 I see there is an "export" option in Automator that creates some sort of package file. Not the answer you're looking for? Browse other questions tagged macos photos usb spotlight trash . Is there a way to prevent those pesky .DS_Store files from being ever created? 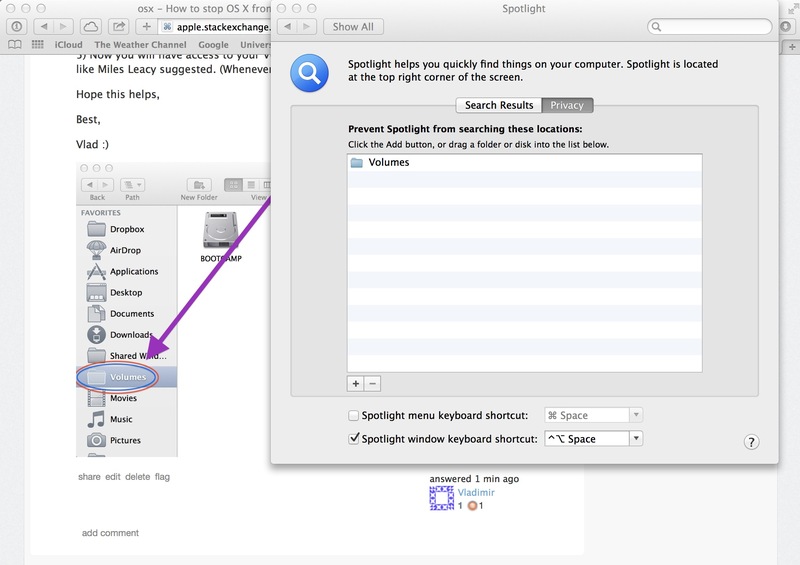 How to UNDO stopping OS X from writing Spotlight and Trash files?